Habit: Perennial herb from taproot, branched caudex, or short rhizome, glandular, sometimes mat-forming. Stem: erect, unbranched, glabrous or stalked-glandular, sometimes with withered, persistent leaf bases. Leaf: basal and cauline, alternate, basal persistent, cauline reduced distally, oblanceolate, 1--3-veined, generally stalked-glandular. Inflorescence: heads radiate, 1--4 per stem in open cluster; involucre bell-shaped; phyllaries in 3--4 +- equal series, lanceolate, 1-veined, outer grading into distal leaves; receptacle convex, pitted, epaleate. Ray Flower: 10--25; ray <= 12 mm, yellow. 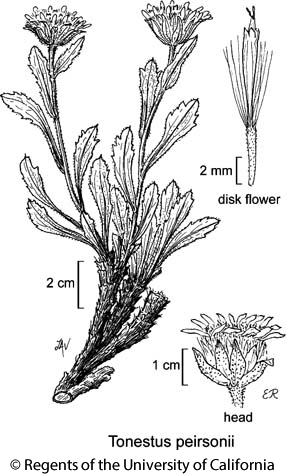 Disk Flower: 25--65; corolla flaring slightly, yellow; anther tip slender, acute, appendage length 2--4 × width; style tips acute, appendage +- equal or > stigmatic portion. Fruit: narrowly oblong to linear, +- cylindric, fusiform, or compressed, glabrous or hairy; pappus of many +- white bristles in 1 series. Habit: Cespitose with branched woody caudex, taprooted. Stem: <= 20 cm. Leaf: <= 8 cm, coarsely serrate to nearly entire. Inflorescence: involucre 14--28 mm; outer phyllaries leaf-like; inner green to +- red distally, papery proximally. Ray Flower: 16--20. Disk Flower: 44--63; corolla 7.5--10.5 mm. Fruit: 2.5--6 mm, hairy; pappus < disk corolla. Chromosomes: 2n=90. Citation for this treatment: Lowell E. Urbatsch 2012, Tonestus peirsonii, in Jepson Flora Project (eds.) Jepson eFlora, http://ucjeps.berkeley.edu/eflora/eflora_display.php?tid=5406, accessed on April 25, 2019.
c SNH (Inyo, Fresno cos.), W&I. Markers link to CCH specimen records. Yellow markers indicate records that may provide evidence for eFlora range revision or may have georeferencing or identification issues. Purple markers indicate specimens collected from a garden, greenhouse, or other non-wild location.